Christian Louboutin‘s ‘Neoalto’ pumps, that you can purchase at Matches Fashion, are designed to captivate attention, day or night. Who do you think looked best in them? Before getting nailed with slime at the 2018 Nickelodeon Kids’ Choice Awards, Heidi Klum hit the orange carpet in an embellished mini dress from the Redemption Fall 2017 Couture collection and Lorraine Schwartz jewelry. She was joined by Skai Jackson, Mariah Carey, and Marsai Martin. Hailee Steinfeld joined Emma Watson, Caitlyn and Kendall Jenner, and Miley Cyrus at the 2018 Vanity Fair Oscar Party in Beverly Hills, California. The 21-year-old American actress and singer wore a Giambattista Valli Haute Couture gown featuring a long train. She accessorized with Djula rings and rounded off her outfit with the same ‘Neoalto’ pumps that Jennifer Lawrence wore just over a year ago. Jennifer Lawrence teased a glimpse of her cleavage at the ‘Passengers’ photo call held at Hotel Adlon in Berlin. She was joined by her co-star Chris Pratt. The 26-year-old actress sported a polka dot print cut-out crop top (available at Ssense) and a matching high waist skirt from the Dolce & Gabbana Spring 2016 collection. Her retro black & white look was styled with a pair of sheer lace Christian Louboutin ‘Neoalto’ pumps that you can purchase at Matches Fashion. You can find Jennifer’s stunning ‘Neoalto’ heels at Matches Fashion. 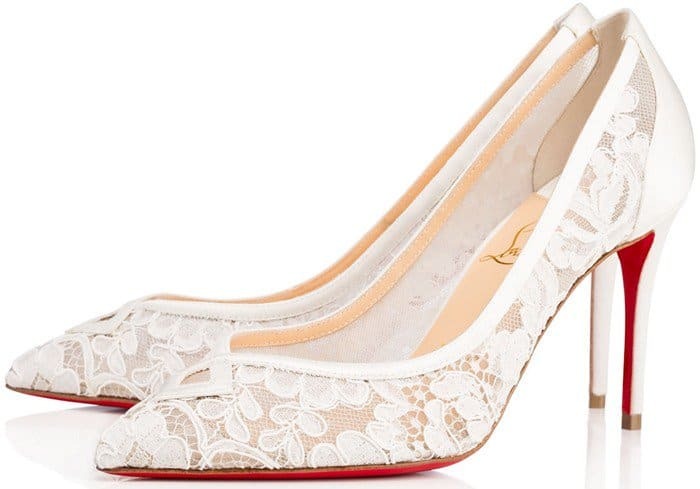 Her black dentelle lace and suede pumps are detailed at the vamp with a peekaboo cutout.